I remember well my first taste of “paddle bassing.” My good friend Jim Davis invited me on a four-mile float down the Ouachita River, a beautiful smallmouth bass stream coursing through west Arkansas’ Ouachita Mountains. On our first morning out, he paddled his canoe through the labyrinth of boulders and rocky ledges that characterize the upper Ouachita. It was ideal smallmouth habitat, and Jim proved it. I followed his directions, using the jig-and-pig he recommended. The lure hit the swirling current just shy of the boulder, drifted slowly downstream and danced past the rock. I saw a flash of gold and felt a solid hit. Instantly, a 3-pound smallmouth went airborne. The next 30 seconds of acrobatics were enough to make an Olympic gymnast blush with shame, but I soon gained the upper hand and boated the hefty bronzeback. Jim took the next smallmouth from shallows edging a long pool. Casting beside a treetop, he waltzed his jig-and-pig through the bass refuge. A subtle tapping telegraphed the brownie’s strike. Jim’s pole rainbowed when he set the hook. I watched excitedly as four pounds of smallmouth tail walked across the Ouachita. Slugging it out to the finish, the copper-hued bass finally came to the boat. Jim released it, as I had done the first. From many of Jim’s selected targets, a sassy smallmouth raced out to wallop our offerings. By the time we canoed to our takeout point, we had caught 16 bronzebacks ranging from 3 to 5 pounds, and a host of smaller fish. That day was a turning point for me. You see, prior to that time, it never occurred to me that a canoe offered special advantages over other crafts used for bass fishing. I learned, however, that some waters, like that little stretch of the Ouachita, can be properly fished no other way. 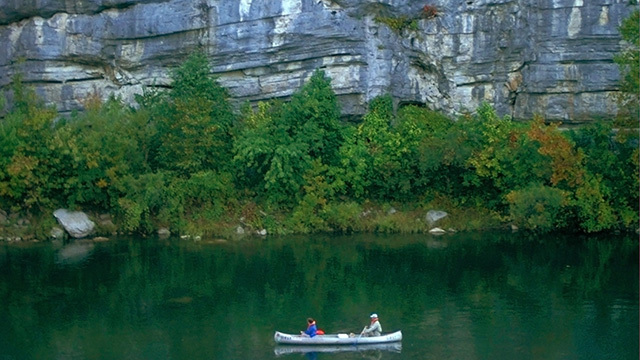 A canoe provides access impossible in a bass boat or even a small johnboat. A canoe carries you over boulders and gravel bars a larger craft couldn’t navigate. A canoe lets you fish where other anglers rarely go. There’s a little cypress lake on a 17,000-acre wildlife area in east Arkansas I once only dreamed about fishing. I walked to it often while squirrel hunting, and knew it probably harbored abundant largemouths, if only because of its remoteness. The lake was a mile from the nearest road. It’s doubtful many people ever fished there. “Then we’ll bring my canoe,” he said. I didn’t relish the thought of portaging a canoe a mile through the woods, but the prospect of fishing that little lake was too much to resist. The next day we did it, and to my surprise, carrying my buddy’s canoe wasn’t much worse than toting a big tackle box. In less than an hour, we traversed the woods and launched the canoe. And though we didn’t catch any bass as long as our legs, the fishing was extraordinary. It wouldn’t have mattered if it wasn’t, though. The experience of fishing a scenic lake that probably hadn’t been visited by another angler in decades was enough to make the effort worthwhile. You can fish from a canoe on almost any type of water, of course. A pleasant experience can be had in a quiet cove on a large reservoir or floating a popular stream in a national park. It’s adventuresome forays into the backcountry, however—trips to the back of beyond where few anglers go—that make paddle bassing among the most memorable of all ways to pursue black bass. The canoe carries you, your buddy and a surprising amount of gear, making it ideal for extended backcountry fishing excursions. You can carry some luxury items such as air mattresses and a roomy tent. Before you venture off, however, be properly prepared. If you rent a canoe, check its condition thoroughly. Call the outfitter’s attention to any damage before you accept it. Carry three paddles per canoe—one for you, one for your buddy and a spare. Have a life jacket for each person, and wear it or keep it properly secured in the canoe and readily accessible. When you cast off, be sure your cargo and passengers are balanced from side to side and end to end according to weather and water conditions, and the canoeists’ and cargo’s weight. Pack your clothes, bedding, etc. in waterproof float bags, and secure the bundles with shock cords to prevent shifting. When you stop to camp or fish, carry your canoe well up from the water’s edge. Stow it upside down in an area out of the wind. If you canoe where portages are necessary, know how to portage the right way. A single man can bear a regular canoe tilted back on his shoulders, if you fasten two paddles on top of the middle thwarts to form a portage yolk. On a long overland hike, wrap extra clothing around the portion of the paddle blades resting on your shoulders to prevent irritation. Don’t exhaust yourself. The pace should be comfortable and as untiring as possible. Let one man carry the gear, the other the canoe, and swap places as necessary. Pick your fishing gear carefully so you’re not overloaded, but be sure to stow a spare rod and reel and extra lures in a safe place in case of mishaps. Many companies make great multi-piece pack rod combos ideal for this kind of fishing. Pick a time to travel when weather conditions are good, then prepare yourself for the adventure of a lifetime. Paddle bassing seems like a lot of work at times, but almost invariably, the extra efforts prove worthwhile. No other form of bass fishing can better soothe the soul of a man weary of the modern world. Best of all, paddle bassing makes memories you’ll always cherish.